The Sculptor Dwarf Galaxy, pictured in this new image from the Wide Field Imager camera, installed on the 2.2-metre MPG/ESO telescope at ESO’s La Silla Observatory, is a close neighbour of our galaxy, the Milky Way. Despite their close proximity, both galaxies have very distinct histories and characters. This galaxy is much smaller and older than the Milky Way, making it a valuable subject for studying both star and galaxy formation in the early Universe. However, due to its faintness, studying this object is no easy task. 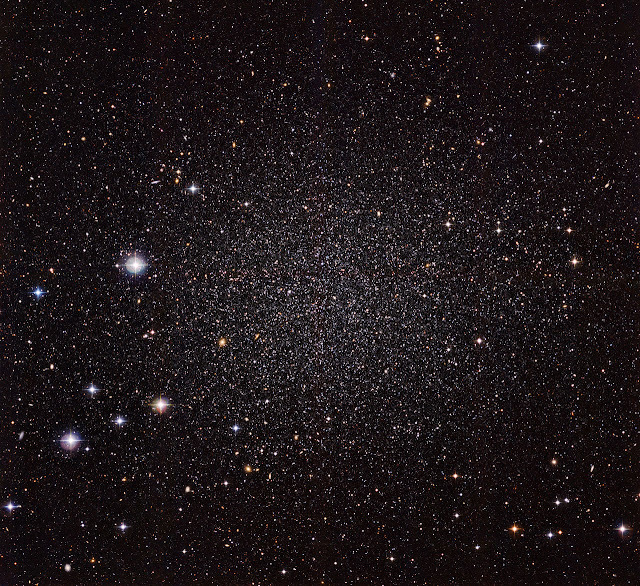 The Sculptor Dwarf Galaxy — also known as the Sculptor Dwarf Elliptical or the Sculptor Dwarf Spheroidal — is a dwarf spheroidal galaxy, and is one of the fourteen known satellite galaxies orbiting the Milky Way. This is not to be confused with the similarly named and much brighter Sculptor Galaxy which is located in the same constellation of Sculptor. These galactic hitchhikers are located close by in the Milky Way’s extensive halo, a spherical region extending far beyond our galaxy’s spiral arms. As indicated by its name, this galaxy is located in the southern constellation of Sculptor and lies about 280 000 light-years away from Earth. Despite its proximity, the galaxy was only discovered in 1937, as its stars are faint and spread thinly across the sky. Although difficult to pick out, the Sculptor Dwarf Galaxy was among the first faint dwarf galaxies found orbiting the Milky Way. The tiny galaxy’s shape intrigued astronomers at the time of its discovery, but nowadays dwarf spheroidal galaxies play a more important role in allowing astronomers to dig deeply into the Universe’s past. The Milky Way, like all large galaxies, is thought to have formed from the build-up of smaller galaxies during the early days of the Universe. If some of these small galaxies still remain today, they should now contain many extremely old stars. The Sculptor Dwarf Galaxy fits the bill as a primordial galaxy, thanks to a large number of ancient stars, visible in this image. Astronomers can determine the age of stars in the galaxy because their light carries the signatures of only a small quantity of heavy chemical elements. These heavy elements accumulate in galaxies with successive generations of stars. A low level of heavy elements thus indicates that the average age of the stars in the Sculptor Dwarf Galaxy is high. This quantity of old stars makes the Sculptor Dwarf Galaxy a prime target for studying the earliest periods of star formation. In a recent study, astronomers combined all the data available for the galaxy to create the most accurate star formation history ever determined for a dwarf spheroidal galaxy. This analysis revealed two distinct groups of stars in the galaxy. The first, predominant group is the older population, which is lacking in heavier elements. The second, smaller population, in contrast, is rich with heavy elements. Like young people crowding into city centres, this youthful stellar population is concentrated toward the galaxy’s core. The stars within dwarf galaxies like the Sculptor Dwarf Galaxy can exhibit complex star formation histories. But as most of these dwarf galaxies’ stars have been isolated from each other and have not interacted for billions of years, each collection of stars has charted its own evolutionary course. Studying the similarities in dwarf galaxies’ histories, and explaining the occasional outliers, will help to explain the development of all galaxies, from the most unassuming dwarf to the grandest spirals. There is indeed much for astronomers to learn from the Milky Way’s shy neighbours.